The NFL Combine is fast approaching and we’ll have full coverage on Buffalobills.com as always. In the meantime let’s get to your questions from email at AskChris@bills.nfl.net and on Twitter @ChrisBrownBills. Would the Bills trade for Kirk Cousins? CB: I think a trade is the least likely avenue the Bills take to acquire a quarterback with NFL experience. Free agency will probably be the first course of action. If they come up empty there then I believe a trade becomes a bit more likely. The problem is the Bills are already a bit limited in assets they’d be willing to move being down a first and a fourth-round pick in this year’s draft. That’s not to insinuate a trade couldn’t happen, but I think it’s near the bottom of the list in terms of the ways they plan to acquire a QB. The only way it moves up the list is if some team unexpectedly offers a quarterback the Bills weren’t anticipating would be available. With Marrone gone, I don’t buy him playing guard. He struggled so much at RT during preseason, I doubt he could move inside. I’d like to see him play tackle. He has an injury history and the Bills should look for free agents instead of moving inside. More upsetting is that the Bills thought he has 1st round potential when Henderson played every snap and looks to be the starter going forward. Where do you see his progression going forward? CB: I anticipate the Bills will be hitting the reset button with Cyrus Kouandjio with a new offensive staff coming in. I believe the approach under OL coach Aaron Kromer will focus Kouandjio’s attention at tackle. As I’ve said many times, Kouandjio is young in football. He’s just 21-years old and has not been playing the game very long. He’s one of those players that will need time to mature into a reliable and technique-sound offensive lineman at the NFL level. Kouandjio is learning on the job, but he has the physical tools to be a solid right tackle. Henderson’s ascent to starter at right tackle was not undeserved. He is an elite athletic talent. He too learned on the job as any rookie does, but has been playing football his whole life. His game is closer to reaching its full potential than Kouandjio’s, but I do expect Kouandjio to be pushing Henderson in camp. I think EJ has all the potential in the world. Do you know if he has met or talked to Roman/Rex yet? CB: There are strict rules under the CBA that prohibits contact between coaches and players in the offseason, even in Buffalo’s situation with a new coaching staff. So EJ Manuel and the rest of the roster cannot interact with the staff by phone or in person in any capacity from the end of the regular season until the offseason conditioning program begins in early April. So the answer is no, he has not met or talked with members of the Bills coaching staff. 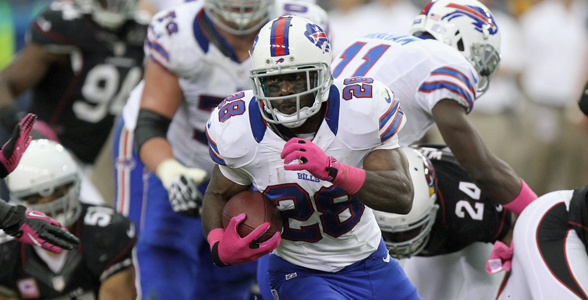 With CJ Spiller likely leaving the Bills, do you see the Bills drafting a RB? Or is it more likely they go after a FA? CB: I think your assumption of C.J. Spiller leaving is not an unusual one, but let’s see how things play out first. Should Spiller choose to sign elsewhere however, I believe they draft a running back. They need an influx of youth at the position and the draft is deep with running back talent this year. Between Gresham, Cameron and Thomas which TE would you be more in favor signing? CB: I think just about anybody would love to have Julius Thomas. He’s the most dynamic receiving tight end of the three and that’s not just because he’s had Peyton Manning as his quarterback. I believe he’s the most savvy route runner of the three. What I like about him the most is he can use his speed to separate from defenders, and he’s physical enough to wall off defenders from the ball as well. The rub is he’ll be the most expensive tight end on the market as well. As critical as the tight end is in Peyton Manning and Gary Kubiak offenses I think he’d be one of Denver’s top priorities this offseason. Gresham is a physical talent that is comparable to Thomas, but he is a career underachiever. Coming out of college he had All-Pro physical talent, but it’s just never materialized the way I thought it would at the NFL level. Cameron is a talented receiving tight end who creates mismatches, but I worry about his concussion history. Obviously NFL teams would be able to investigate that a lot better than I could, but at a position that’s susceptible to big hits I’d take a long, hard look at his injury history before making an offer. 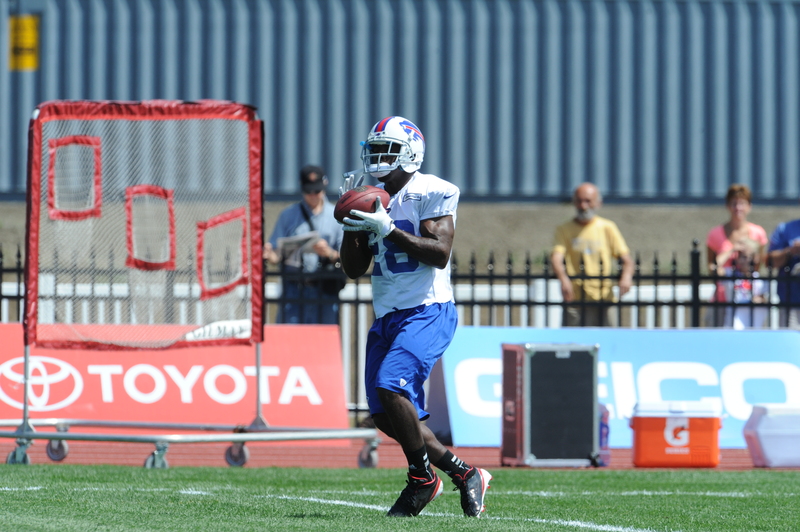 CJ Spiller was just serenaded by Bills fans at tonight’s practice. With his birthday being tonight they just sang happy birthday to him. Spiller turns 25 today. You never want to go into a bye week with a loss and have to sit a week and think about it, so this week means everything to us and to me. We know we’re up against a tough challenge in the Titans, but with the preparation we’ve put in this week we hope we can come out with a win and head in to the bye with a winning record. For me, the bye week is definitely a chance to get away. I like to recharge at home, spend some quality time with family and catch up with old friends. At the same time though, it’s a chance to relax and prepare for the long run we are trying to make in the final half of the season. For those who follow me on twitter, you know how big of a Clemson fan I am. Every time you can see your alma mater do well it’s great. I know a lot of the guys that are still on the team and of course with the coaching staff – they helped me out both on and off the field. To see them be successful now means a lot … and it gives me bragging rights in the running back room. I keep in touch with the Clemson guys – coach Swinney and I communicate when we can. Coach sent me a text after the game Sunday congratulating me on a career day (I was even nominated for FedEx Ground Player of the Week!). Whenever we have a bye week, I usually try to get down to Clemson to catch those guys and hangout. It’s good to see some old faces. As far as trash talking and bragging rights go, we’re all pretty even. Corey McIntyre has the bragging rights on me right now because his West Virginia team dismantled mine in the Orange Bowl last year. But right now, Clemson is 2-0, Fred Jackson’s Coe College team is 2-0 and West Virginia is undefeated … so we’ve been taking it pretty hard on Tashard Choice (Georgia Tech) because his team lost. Next week when we’re on prime time TV I need my Tigers to come through because I’ll never hear the last of it after the game! We play our first preseason game this week! Everyone’s excited for football season starting and fans are going crazy. The main thing for me to prepare for a game is to go over the stuff I’m going to be doing. The typical mindset throughout the week is going through the plays that are going to be run and making sure that I’m familiar with all the formations and play calls so that once the game starts I’m ready to go. Even though it’s preseason, I never try to say, ‘Well I’m just going to do this much because my load is going to be light,’ because you never know what’s going to happen throughout the game. I try to soak up as much as I can throughout the week, especially during preseason. I can take it back to my rookie year, when Fred Jackson and Marshawn Lynch went down in the same game. Who would have thought both of them would have gone down? But I prepared throughout that week like I was going to be the starter. Unfortunately it did happen, and I was ready to go. I was always told that as long as the cameras rolling you want to go out there and put on a good tape. When you get to that first game though, that’s when you know it’s for real! Can’t want to play some football! Go Bills! Welcome to my blog, where I’ll be sharing some photos, videos and thoughts with you throughout camp as this year gets going. I’ll be asking to hear from you later, but you can always catch up with me on Twitter @CJSPILLER. Every season is its own new thing, but each of my three with the Bills have been very different. After Clemson and the Draft led into my rookie season, last year we had the lockout. This year though, we had a more traditional offseason and I hope it helps us build on some of the good things we did in 2011. The main difference from this year to last year was that we didn’t know when the season was going to start and when the lockout was going to end. All of us wanted to work hard but we had to be careful not to go all out and not have anything left for the season. It’s been beneficial to have a “traditional” offseason, especially for me. I can tell after doing my own stuff and being with the team during OTAs and minicamp – I’ve been able to get into the playbook and get back to being familiar with the terminology. Getting out there and running routes and running plays has made a big difference. I don’t really have anything special that I have to have with me during training camp, but I did bring my TV and PlayStation. I play video games every now and then, but not like some of the guys. I brought some movies as well, but training camp for me is mainly getting away, getting into the playbook and getting my mind ready for the season and trying to build from where I left off last year. I tell people all the time that last year is gone for me – I did a good job of trying to take advantage of the opportunities that were presented, but this year is totally different. I want to try and improve the things that I didn’t do well, while making the things I did do well better, too. After every season I go back and look at all of my runs and pass protections – both the good and the bad – just to see what I can do better. That’s all for now – go Bills!